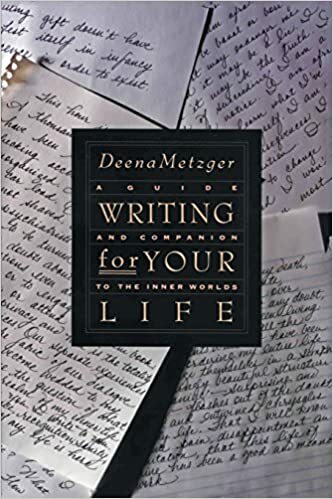 This post includes a summary of Writing for Your Life: A guide and companion to the inner worlds by Deena Metzger. My notes from when I read the book are also included in the post. I first came across Deena Metzger's book, Writing for your life: A guide and companion to the inner worlds, in 2009. I have collected a variety of books on the craft of storytelling, and thought this one sounded interesting. Writer and therapist Deena Metzger enables us to heal what is fragmented, injured, or suppressed within us, and experience the wonder of self-knowledge and the joy of creation. In this resource for writers and nonwriters alike, Metzger helps us explain ourselves and our creativity through journals, autobiography, stories, fairy tales, dreams, and myths. She offers stories and suggests numerous exercises to show readers how writing shapes and informs our lives, and how our "silence" hinders us. Throughout the book are numerous writing exercises. Unlike some books with a few numbered exercises at the end of each chapter, the writing exercises in Writing for your life are interwoven between narratives and experiences of the author. On of my favorite recommendations from the book is "If you have never kept a journal, this may be the time to begin." One of the first exercises is to keep a journal of your normal every-day environment as you might view it from the perspective of visiting another country. This exercise, like many in the book, forms the basis for additional exercises. I first read Writing for your life in 2009, based on my dated notes. There are many exercises in the book, but my notes only included ones from the first few chapters, so I'm not sure what happened. In reviewing the book again now in preparation for this post, I noticed several other exercises I want to try. However, for this post, here are the exercises I liked on the first reading. 1. Write anything for five minutes. 2. Keep a journal writing as though you are visiting a foreign country. 3. Write your autobiography in five minutes. What did you omit? 4. Things I didn't see today. ★It is not generally important enough from a literary perspective. ★It is too private and therefore trivial from a literary perspective. ★It would embarrass you to speak about. ★It would embarrass or offend your family or associates. ★It would embarrass or offend the reader. Select the three or four subjects, images, or experiences that made you most uneasy or that hold the greatest emotional charge for you. Set aside your inhibitions and attempt to write on these subjects. I also included a list of story ideas in a massive list of story prompts.